Today the tract is an immense lake, up to 15 feet deep, with fish prowling the water and ducks skimming the surface. The adjacent Mokelumne River, swollen by the intense storms that have drenched the state this winter, caused a levee to break, allowing the water to rush in. A spokeswoman for FERC pointed out that the commission had the authority to reopen a hydropower license, and that the agency’s dam safety program reviewed rainfall and storm data every five years. But Dr. Viers and others say climate change has not been factored in. In 2009, for example, FERC rejected climate change studies in relicensing several hydropower projects in Northern California. Dr. Viers refers to the Cosumnes as the state’s “ugly duckling” river — it has never fit into water-management plans. As a result, unlike all the other significant rivers on the western slope of the Sierra, the Cosumnes is essentially undammed and flooding is largely uncontrolled. Farmers in the area have adapted, growing crops or raising orchards that can tolerate winter inundations. The flooding can be a nuisance nonetheless. For days at a time over the last month, Michael Eaton, a former official with the Nature Conservancy who has a small farm at his home in Galt, has had to leave his car on one side of a flooded driveway and paddle a canoe a couple of hundred feet to reach the property. “It gets a little tiresome,” said Mr. Eaton, who is thinking of having the road raised. At times, Mr. Eaton said, he can see and hear air bubbles popping up through the water as it infiltrates the soil. “It’s groundwater recharge in real time,” he said. 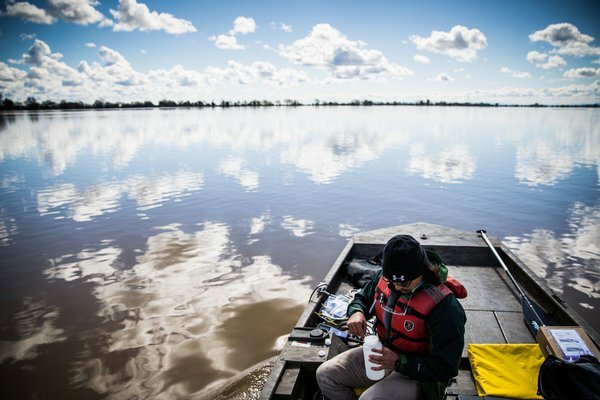 The undammed nature of the Cosumnes also makes it a useful laboratory, both for studying how stream flows and flooding are changing under more natural conditions and for assessing the impact of green infrastructure. Not far from Mr. Eaton’s home, the conservancy bought a 500-acre plot along the river, called Oneto-Denier; punched a hole in a levee to turn it into a floodplain; and planted native vegetation as part of the restoration effort. Dr. Viers and others have been studying the plot, and so far the results are encouraging. Among other things, they have measured a significant amount of water returning to aquifers. “This little ugly duckling is now showing us the way in which we can better manage rivers downstream,” Dr. Viers said. For the complete story, see NYTimes.com or download a print.